Basket is started on a wooden base. You will plant the bulbs in the ground, (smoked reed) and watch your tulips grow as you weave this basket. You finish with a beautiful lace-edge rim and attach your unique handle that was Amish made just for you. Tools needed: Weave-rite tool, lg. eyed needle. The dyed reed and cross stitch design in this cruise themed basket resembles beautiful sea glass and a fishing net. 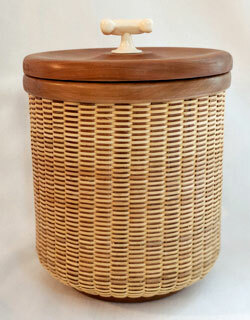 The basket starts with inserting natural spokes into an oblong wood base. Techniques include traditional weaving methods, triple twine, continuous cross stitch weave and finishing with a single lashed rim. Do you have a pampered pooch? Wouldn't they love a Nantucket Basket canister to hold their treats?! 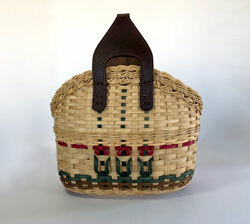 Construct this 1 Quart insulated basket using cherry and cane. 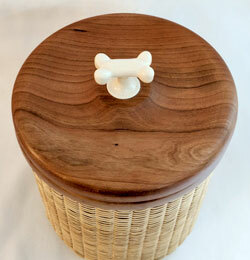 Basket is completed with an Acrylic Dog Bone knob. No pampered pooch, no problem! Trisha will have other knobs available if you would just like to have this beautiful Nantucket canister for your very own. This is an insulated canister that could also be used as a small ice bucket. Delightful woven bracelet that you'll be proud to wear. The bracelet is woven with sterling silver and 14K gold filled wire. Framed by a 14k gold filled half round wire. The bracelet accents both formal and informal attire. 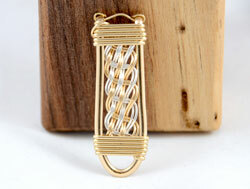 There is a matching woven pendant also available. 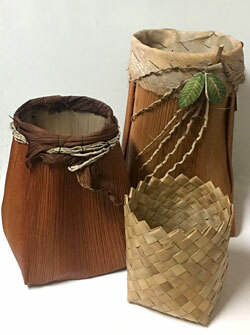 We will start the day with the lauhala basket. It is the 'lock' method of weaving. Once you learn this method you can make coasters, hot pads and baskets of any size ... the possibilities are endless. I will bring an extra supply of lauhala and a stripper for more kits. In the afternoon we will make the palm basket. There will be an abundant supply of seed pods, beads and natural items brought from Hawaii to personalize your basket. We will also make my own unique Hawaiian rose from the philodendron sheath to add the final touch! As a bonus I will demonstrate how to mount palm on a wood block to create tall, elegant works of art. 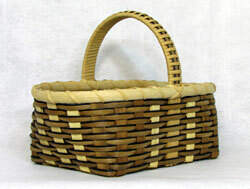 This small market basket with a solid woven base is handy for collecting and carrying small items. The space-dyed reed and unique reverse handle wrap add to it's charm. Several color choices will be available. Tools needed: Small packing tool, 2 small clips, 18 clothespins. This small basket is handy for many uses. Placement of the natural and smoked spokes adds visual interest to the base and side. Black round reed woven with the smoked flat oval gives a dramatic effect. The wrapped handle is the perfect finishing touch. Learn the techniques of Ozark White Oak basket making from Billy Owens, a second generation maker, who does all the gathering of materials from cutting down the trees, to preparing all material that you will use in this small Ozark style market basket that has a 9" x 15" Woven Oak "herringbone" bottom and is approx 8 1/2" deep excluding the solid Oak handle. 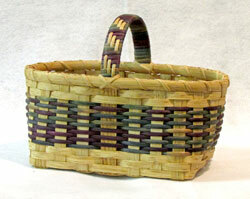 Enjoy weaving and learning about this traditional white oak basket making from Billy. 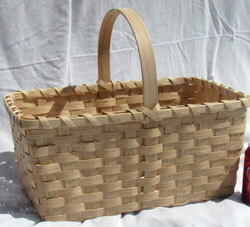 This basket is sturdy enough to use in the garden, beautiful enough for any decor.